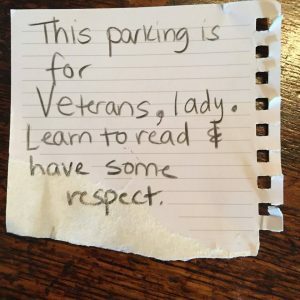 By now you may have seen the article about the scolding note left on the North Carolina Vet’s windshield for using a parking space reserved for Veteran’s. Rebecca Landis Hayes posted the note left on her windshield to social media along with her feelings about it. It’s an interesting story and you can read it any a number of media outlets and it’s worth the quick read. Click here to read the story then come right back because we are going to analyze the handwriting of the note and see what stands out! First: the writer is a printer. There is no cursive writing. Printers like to keep an aspect of themselves private or hidden. In this case, it is an anonymously written note. She (or he) kept her (or his) identity, well, unidentified. Notice the use of pressure on the letter “t” in “respect.” It is written with a lot of pressure! Heavy pressure indicates great intensity of feeling. And the letter t has to do with self esteem and even mental health. By the time the writer had finished writing the word respect, this person was feeling pretty darn strong about showing respect! The vertical slant reveals this writer thinks logically. When someone writes with a vertical slant they are logical and fair. 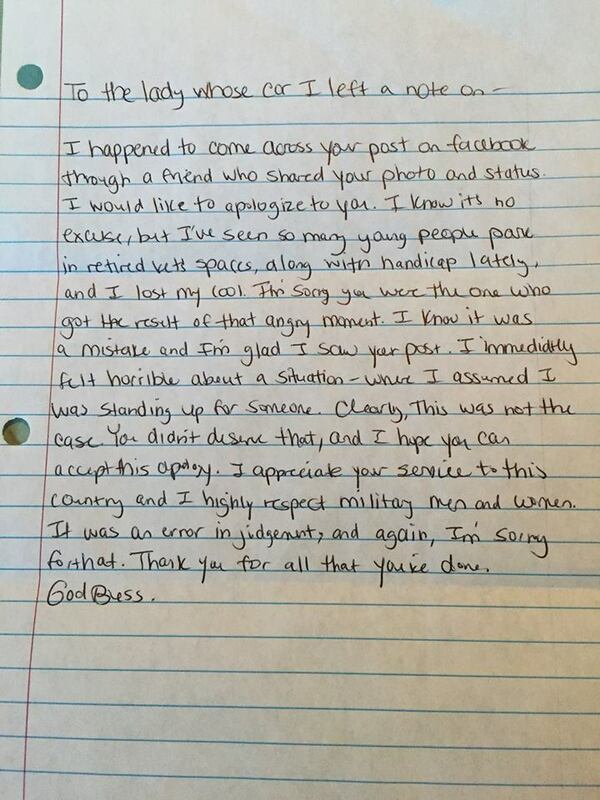 So to person who penned this anonymous letter, (s)he saw a woman get out of the car and according to misguided logic, didn’t see a shred of evidence that the woman getting out of the car was a veteran. Apparently the writer thought a veteran would have been a man, or at least would be wearing their uniform! We don’t know what this guy or gal was thinking except that in their mind, they were coming to a logical conclusion. What is also interesting about the handwriting is that the a’s and o’s (also known as “talk letters”) are very clean. There are no extra marks, slashes, no other marks contaminate the integrity of the talk letters. This usually reveals honesty. In fact when I see this in a client’s handwriting and remark that they are quite honest, every time I get the same response…..”To a fault!” they say agreeing with me. So what happened after this 8 year veteran took her story public, spoke up for herself, called out and responded to the anonymous writer? Well first off the news media picked up on it! And secondly, in the article you will see that she educated the anonymous note writer that Veterans come in all genders, shapes and sizes and don’t always walk around wearing their uniforms 24/7. What happened next is the “leaver-of-the-note” saw the article and due to her honesty, felt (s)he had to fess up. Their conscience wouldn’t allow them to stay silent and the person wrote an honest note of apology. Basically it was apologizing and logically explaining why the note was left in the first place. What I found of interest in the apology letter from a handwriting analysis point of view is that now the slant was no longer strictly vertical. Now, many of the words slant to the left. For example, “felt horrible” just to name a few. Any writer whose writing *slants to the left* is basically shy and the text book example in my RMGA online home study course clearly states that many “Poison Pen Letters” have been written by the writer with a left slant. On a side note, people who have been through a recent set back or trauma can find the slant of their writing changes to a left or this backward looking slant. When this printer saw their note and story had gone viral, they realized they had made a very VERY public faux pas for thousands to see. That may have felt like a big surprise and shock! The left-slanted writer tends to retire into their shell and retreat as their place of comfort. Yet, isn’t it interesting that their inner sense of honesty and integrity still made them speak up. (Remember those “clean” a’s and o’s?) The writer simply chose to do it from the privacy of their anonymous shell. Rebecca Landis Hayes accepted the apology with grace and the story had a nice ending. So who says nobody writes handwritten notes anymore? Handwritten notes hold such impact these days. Consider sending a nice one to someone, today. Michelle Jordan Kennerly Truly respect the lady for admitting her mistake and taking ownership. Bless her ❤️. What a great story of true humanity. Thanks for sharing. Edward Frazier It sounded like Jim Frazier felt pretty bad about it. Miranda Dimond Crawford Awesome and kind of crazy that she ended up seeing the post !